Posted by David Gillespie in creativity, strategy. 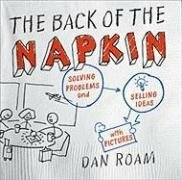 Earlier this week I finished Dan Roam’s Back of the Napkin which, while I would have appreciated more practical application of his ideas, was great none the less, and a good primer for visual thinking applied to business situations. No sooner had I put that down, I picked up Marty Neumeier’s new book, The Designful Company. If his name rings a bell, I’ve likely told you before about his previous book Zag, and you may even know of the one before that, The Brand Gap, kindly available over on Slideshare in totality. It’ll take you 10 minutes, go read it, then come back. Marty uses the book as a platform to expound the virtues of design thinking, something that has been on my mind quite a bit lately. Something I really believe but perhaps haven’t articulated all that well in the past is that in order to bring new ideas to the table there’s little value in mining the places everyone else is looking; subsequently I’m more likely to read Fred Wilson than Copyranter when thinking about advertising, though both are great. That’s not right or wrong, it’s just my take, those of you reading A Big Life In Advertising keep at it, I imagine we want different things anyway. I’m only part way through but Marty is hitting on a number of memes that have been floating around recently, certainly touching on the territory recently mined by Seth Godin in Tribes. It isn’t resonating the way Zag did yet, but it’s interesting none the less – I’ll let you know whether I really think it is worth the coin when I’m done. It’s certainly touching on some things I’ve thought previously, particularly being willing to be wrong, but I cna hardly say I like the parts of the book that agree with me now can I? While I’m here, I stumbled across Design Thinking, a blog written by IDEO‘s CEO Tim Brown, FYI for those interested. Posted by David Gillespie in philosophy. Hope was part of the thrust of the presentation I gave, the other was value. We would raise hopes, set a price on those raised hopes, and then afterwards the customer decided whether or not they got value. My point was (and is) the seller mitigates value by adjusting the level of hope in the buyer – the price point is almost irrelevant (ok it’s not, but humour me here). So I agree with Seth, marketers sell hope. But once money exchanges hands, hope transforms into value – either good or bad. Hope isn’t ever received by the buyer, and if one really wants to get into semantics, you could argue hope never actually existed with the seller in the first place. There’s a link here somewhere to Schrödinger’s cat, though I can’t quite wrap my head around it. Anyone want to have a go? Oh, and the (not very good) presentation is below. Posted by David Gillespie in business strategy, philosophy. That struck a chord with me, and reminded me of a piece I posted back in September on treating people’s contact details as a new currency, something to be traded in exchange for value. I believe companies need to offer great value in order for my permission to contact me, and for the most part people are far too flippant in this space. Create more value than you capture. Make it worth me putting in my email address, deliver more entertainment than seems reasonable for my $10. What I’m really saying is show me you value my attention even if the only thing you get out of it is your message being heard. That tells me you believe what you have to offer is worth something, and hopefully more than what you’re asking me to give up in exchange. Go read Tim O’Reilly’s piece that the quote is from, entitled Work On Stuff That Matters. There is no better way to start your day. From DDB New Zealand, via the completely adored Bad Banana Blog.